Mid-range-chain-ophobia! One of my favourite topics. Must. Not. Be. Seen. Liking. the Pizza Expresses, Stradas, Cotes and Cafe Rouges of this world. I see them as places that dish up food of adequacy. Does the job, fills a hole etc. - which is pretty much what you've said. When I work late, I get a takeaway from Wagamama. Certainly beats a Tesco sandwich. Richard - I don't have anything against mid-range chains per se (my other blog is a love letter to a mid-range chain called Din Tai Fung). I don't dislike these places because they are chains, I dislike them because of their crushing mediocrity. Why should these places be as you put it 'places that dish up food of adequacy'? Shouldn't they aim higher, like chains do in Asia? I think they should. And some do imho, for instance Byron. I agree these chains in London make no sense as there are so many good restaurants serving all kinds of cuisines. However, somewhere like West Sussex where I live, Strada IS the best Italian restaurant around. When there are only 2 or 3 sushi places within 30 mile radius, one cannot be choosy. All the Chinese restaurants still have the same menu as in the '70s where sweet and sour pork balls rule... I could go on. 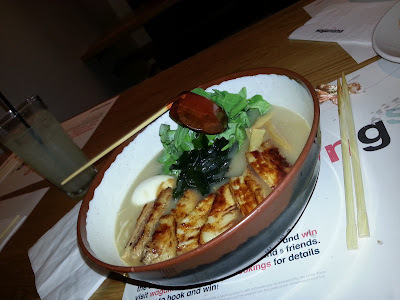 My point is, out here in the provinces, places like wagamama and strada can be a godsend, with their fairly consistent service and edible food. As you say, they scratch my itch for various non-british food until my next trip to London. Anon - you raise a good point; one can get spoilt in London. Your first paragraph makes me feel so old, as I remember when Wagamama first opened! My colleagues & I were so excited to go to the Lexington St one. It was when my job was developing WAP shopping sites. Oh lord, I am SO OLD. I tried this out at my local WM. Whilst it was a good sized serving it did have some issues. 1) The raw pea shoots didn't work, they were uncooked and 'grassy' I was trying to submerge them in the broth to try and take that edge off. 2) The noodles hadn't been rinsed properly so had a bit of 'lye' taste, kinda basic technique that they haven't taught the kitchen. But the bambooshoots were nice and the pork tasty. It was an ok fill up, but I could have done better at home, TBH. Anon - I think the pea shoots would work if the broth was steaming-hot, but otherwise I can see how they might annoy you. And yes! Noodles should always be rinsed!